Make Your Plans to attend “The Greatest Show on Earth” as the Ringling Bros. and Barnum & Bailey Presents, “Out of This World”. SAVE ON TICKETS TO THE CIRCUS AND HAVE BREAKFAST COVERED FOR YOU! 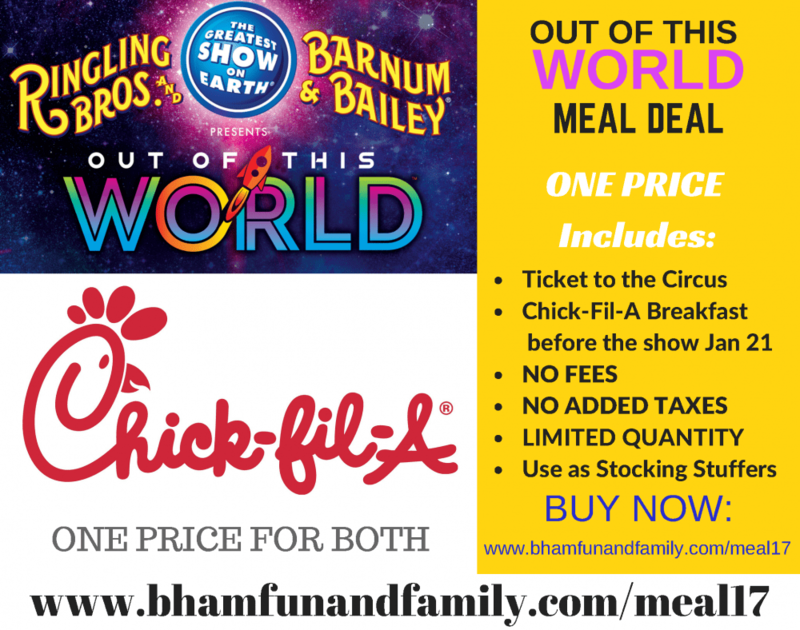 Enjoy the Circus and Chick-Fil-A Meal Deal with great savings. Breakfast Time: Starts at 8:00 AM and closes promptly at 10:00 AM. Ticket Price includes the following: Chick-Fil-A Breakfast (chicken biscuit, fruit cup, and drink – orange juice or water) plus, you get into the show. Ticket: Upper Level at $25 **All fees and taxes are included. No extra charges. SEATING LOCATION: The actual seating section will be in sections 14-18 UPPER rows B-G. It is the $25 price tickets sections with no fees, taxes and breakfast included. MEAL LOCATION: Arena Club on the North side of the BJCC Legacy Arena in the courtyard. TICKET Pick Up: Your tickets will be available for pickup at the breakfast. The tickets will not be mailed to prevent them being lost in the mail. Instead, we will have your tickets for you. Please bring your email receipt for verification to the breakfast to claim your tickets. LIMITED QUANTITY, SO PURCHASE TODAY!